Keenly priced the Roky 115 is a worthy investment as evidenced by the fact it has been Kerrick‘s number one selling wet dry vacuum cleaner of all time! 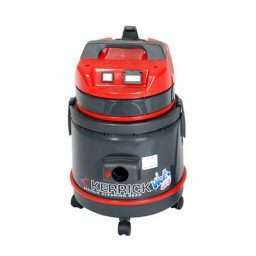 The Roky 115 wet and dry vacuum cleaner is a mid-sized, high suction machine that picks up both wet and dry waste. Its robust reliable nature, coupled with its user friendly system makes this vacuum cleaner popular highly popular with automotive detailing, workshops and schools. Features include; strong suction, a swivel end cuff for easy movement, a high impact corrosion resistant tank, quiet operation and an anti-bacterial cloth Sanifilter.